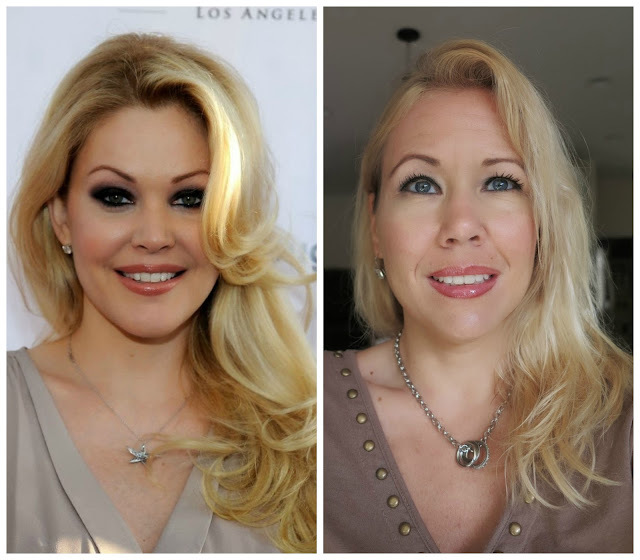 A couple of weeks ago beautiful Angela from the youtube channel BEAUTY GEEK (you should check out her videos- she does some really nice Make up tutorials there) told me that I looked in one of my videos like Shanna Moakler. Well, to be honest I have never heard that name and had to google it! Haha! So now I know that she was 1995 Miss USA! Wohoo! Thanks Angela for that compliment! Angela herself won a pageant The Mrs. Oregon America Pageant. Angela said to me I should do an Shanna Moakler inspired Make up tutorial and I said: "No, I`m not a Make up pro". But later I thought about her idea and I thought to myself "Why not?". So, here is what I did! I started with a primer on my eyes (I used a primer from my NYC palette). Then I used from my JLB Eye palette (Read my review) the black color. I dipped my brush first in a little salt water- this will make it so much easier to apply and the eye shadow will not crease for hours! Then I used from the same palette a grey shade for my crease. This I applied without the salt water because this way it blends much better. Next I used my new Maybelline gel eyeliner. (Since the eye pencils did not work out much on me I am trying now this version). For my waterline I used the JLB cosmetics eyeliner pencil. Time for the eyebrows. Shanna Moaklers eyebrows are more round then mine, so I tried to draw mine more round as well. I just used my brown JLB cosmetics eyeliner for that. Usually I never put anything on my eyebrows because I always find this looks too harsh and that it makes you look older. Then I used my NYC Lip liner. And my LipFusion Infatuation gloss. And lots of Mascara! (I used my Estee Lauder Sumptuous Mascara). As a foundation I used my Maybelline Fit me Stick and then some blush from Lancome. Have a great week you guys- I mean girls!